But the truth is diabetes has kind of taken a back seat the past couple of months. Not back seat like, "Oh my gosh! I locked my kid in the back seat of the car with the windows up in 130 degree temperatures for 48 hours and I totally didn't notice!" More like, "Oh my gosh! You were so quiet watching your movie that I forgot you were back there for a few minutes!" Diabetes never lets you forget about it for long. Even if you actually TRY. We've had so much going on. There hasn't been time to pour over numbers. Obsess about what's not working. I simply haven't had it in me to THINK about much of anything. It's been one foot in front of the other. And that's actually not been so bad. I haven't had time to deal with diabetes. Or the emotions that come with it. And after a while... that pretending (or forgetting or ignoring or whatever) kind of stuck. And it was nice to forget for a while. 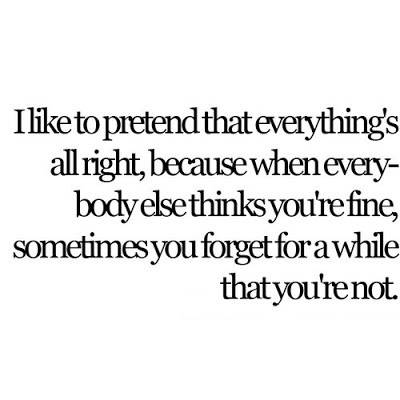 But pretending can't last forever. Diabetes only stays in the background so long. It starts seeping in. Like it or not. The flash of the meter. The trembling of hands. The stains of blood. A tear. A comment. And all the pretense crumbles. There it is. The pain, sadness, frustration, fear, anger, overwhelmed feeling is back. It's not quite the same. Not quite as strong. Maybe it's knowing that you can survive just fine when you're not on your A game all the time. Maybe it's knowing that your child's A1c can stay exactly the same without all the obsessing. Maybe it's realizing that you can take a little mental break from time to time and everyone stays alive. Maybe it's seeing that you don't have to put so much pressure on yourself to be perfect, to be "ON" all the time. Whatever the reason, I'll take it. Another weapon to add to D arsenal. Thanks for sharing - hope your husband is feeling better! I have noticed that I have days and days of obsessing over my daughter's numbers - and to be honest - it just gets soooo old. Especially because we all know in the diabetes world that 1 + 1 does not equal 2. It does sometimes, but not all the time. We have weeks where numbers are great and weeks when they are not. We have just learned to roll with it the best we can. Thanks again for what you do! sometimes other things, other people, have to be the priority (though having a heart attack is a bit on the extreme side!!!) and we have to change our focus. I love this post. I have been silently reading for a while. My daughter is fairly new T1D. Dx was February. Thank you so much for sharing your thoughts, advice, and blog with me. I think this happened to me, briefly, this week. I felt very grown up and well-adjusted for a moment there. You describe it perfectly! Hi, I loved you post. Well having diabetes is bad news but we can adjust with it. I have a lot of good stuff for diabetic patients you can vist my website to learn what to do when you have diabetes of any type! !